Wow, there is another 4G LTE operator here in Nigeria to compete with the already existing 4G providers which are MTN-VisaFone, Ntel and Smile 4G, Spectranet, Swift. This new company was launched on the 23rd of August, this year 2016. Let's stand as we welcome InterC (a new 4G LTE provider in Nigeria). Hmm, if you are still using smartphone that support 3G Only, sir/ma, you need to upgrade as 4G LTE is the latest deal in town now. Some of us might not know that InterC is a rebranded name from InterCellular. I don't know if we could remember interCellular X “hello Moto”? 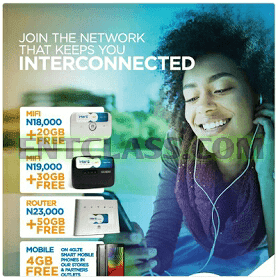 InterC is a rebranded Intercellullar that has partnered with Transsion Holdings (makers of Infinix, Tecno, and iTel phones), Ringo Communications, and Yudala. InterC is here to offer us fast internet speed at a very affordable price. According to InterC, they will be offering free internet for the first month, and 25% off on the second month. 75GB for N12,000 (6PM – 6AM 30 Days Validity). They will start operation in Abuja, Port Harcourt, and Kaduna at first, before rolling out to Lagos and other locations. You are free to check out their site Here. Hmm, after seeing their data, price and validity, do you think it's cheap? Or what do you have to say about their offers? Let's hear you via the comment box below.